W2COMP sent me their Probox2 EX Android TV Box (click link for full specs) powered by Amlogic S802-H processor with DTS and Dolby hardware decoding, 2GB RAM, 16GB eMMC, and the usual USB ports, and wired and wireless connectivity. Probox2 EX is a direct competitor to MINIX NEO X8-H with similar features, and it also comes with an air mouse called Remote+ with gaming and voice control functions. Today, I’ll post some pictures, and videos about the device and its internal, following by a full review sometimes next week. I’ve received not one, but two boxes in the package I received via Fedex. The first package contains Probox2 EX Android media player, and the smaller one Probox2 Remote+ air mouse. The device comes with a few accessories including a 5V/2A power supply, HDMI and AV cables, an external Wi-Fi antenna, a micro USB to USB cable, an infrared remote control. 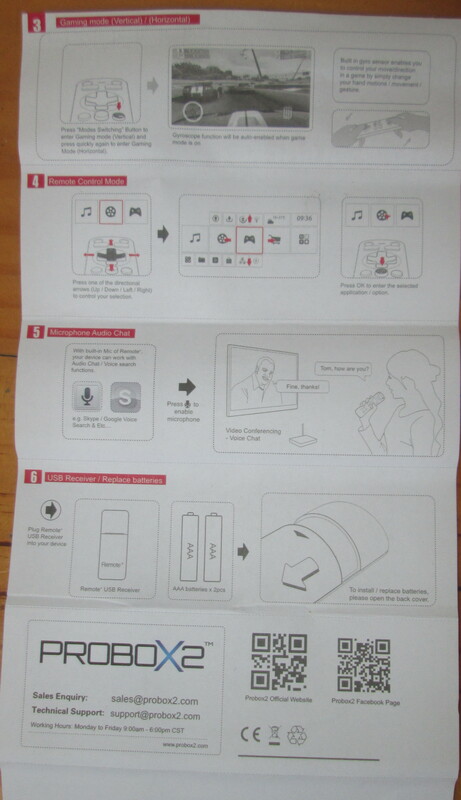 and a user’s manual in English. The power button can be found on the top of the plastic enclosure, which IMHO is more convenient than a power button placed in the side, but that’s just a details. At the back of the device, we’ll find the power barrel, AV output (also used as a firmware upgrade button), an Ethernet port, HDMI output, optical S/PDIF, and on the side, we have all USB ports (2x USB 2.0 host ports, 1x micro USB ITG), as well as a micro SD card slot. An Wi-Fi antenna connector can be found on the other side. Now let’s open the air mouse package. 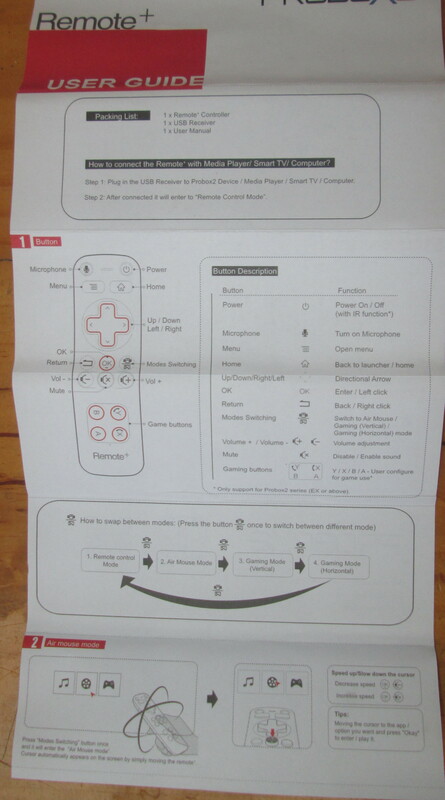 It contains the air mouse, the RF dongle and a user guide (See side and back of the guide for reference). The main listed features are: 2.4GHz technology, six-axis remote control air mouse + gaming + gyroscope + mic. It can be used with Android, Linux, Mac OS and Windows just like all other air mice. There’s no internal battery, and it’s powered by 2 AAA batteries that are not included. 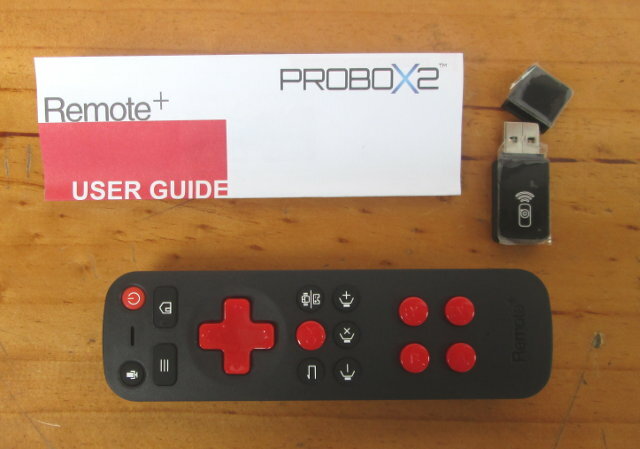 The video unboxing of Probox2 EX and Remote+ can be watched below. When I tried to open the device, I was surprised not to see any screws. It can’t be a pain to open casing that are just clipped, but thsi one came off pretty easily. 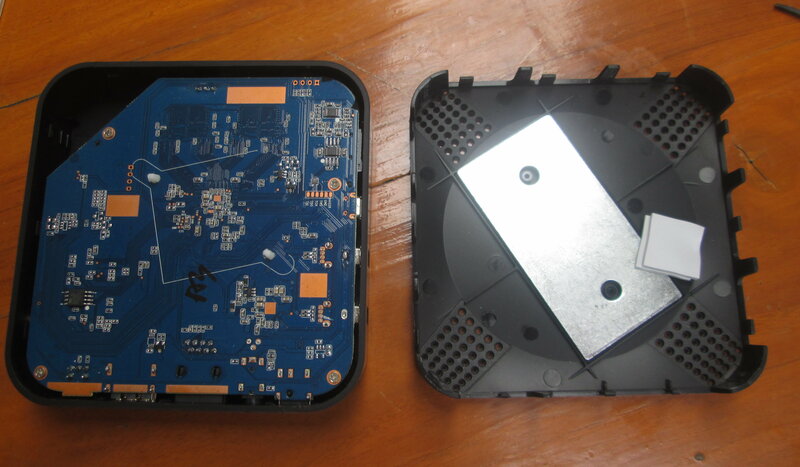 You just need to insert a sharp object such as a flat precision screwdriver on the bottom of the enclosure, between the two plastic parts, and it comes off pretty easily. There’s a steel plate at the bottom, and some pads to protect the board, and maybe help with heat dissipation. But there’s not much to see here, so let’s remove the four screws holding the board. 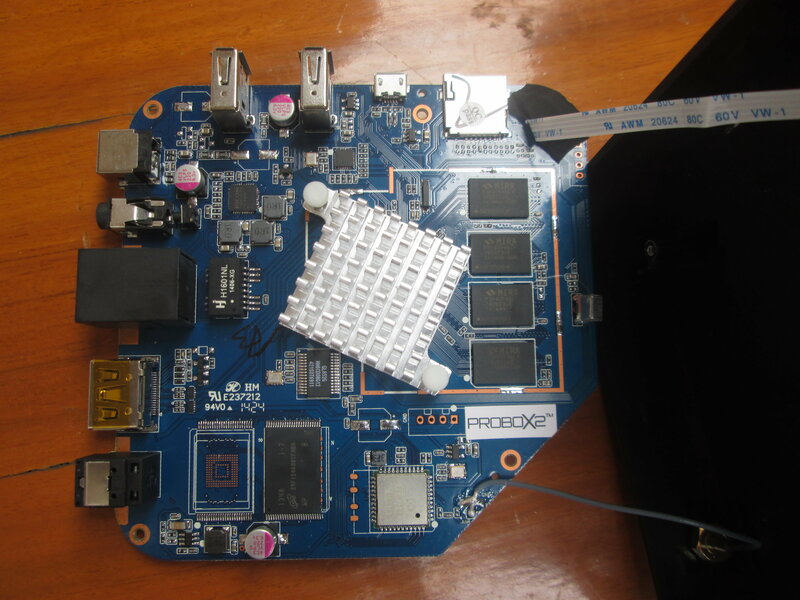 There’s an aluminium heatsink on top of S802-H SoC, the Wi-Fi module is AP6330, and the UART pins can be found on the left of PROBOX2 sticker on the bottom right of the board. You’ll also notice the switch for firmware upgrade just behind the AV jack, a solution commonly found in Amlogic devices. 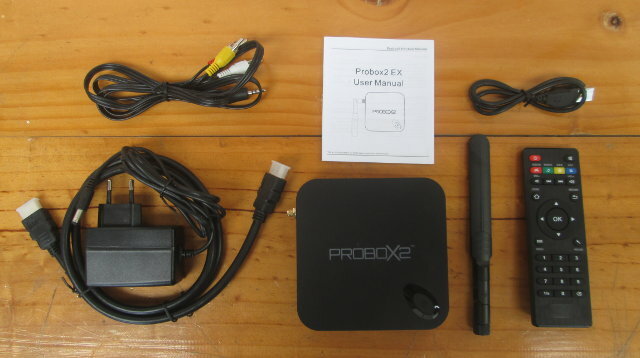 Probox2 EX can be purchased for $149.99 on W2COMP including shipping, and a Probox2 Remote+ air mouse. When you do full review please let us know if composite video output is displayed in 4:3 format for older TV. Thanks for unboxing. Externally (and remote) looks the same as the dubbed “MXIII” except the external wifi antenna. The MXIII comes in two variants: 1GB RAM/8GB NAND and 2GB RAM/8GB NAND so this might be the third one with 2GB RAM/16GB NAND and S802-H. Remote looks pretty good, better than whats in the MiniX box (which is IR with bare minimum buttons), also battery’s are better then those annoying rechargeable RF remotes everyone else seems to use. It’s a pity they didn’t include some basic play/pause and stop buttons on the remote, everyone seems to omit those yet Android supports them as does XBMC. I like built-in batteries, they avoid me the hassle to go purchase batteries. Why don’t you like the built-in batteries? Because they aren’t replaceable? I really like the WeTek Play remote I’ve just reviewed.. The only downsides I found are the two AAA batteries instead of built-in battery, and the lack of qwerty keyboard… All keys I commonly need are on the remote. Also Beelink M7B on GeeBuying looks exactly the same externally while it’s 2GB RAM/8GB NAND and S802.